Let it be known that: 1. This is an article produced after just a few weeks use of this product. 2. The article is not exhaustive, as it eschews USB operation in favor of S/PDIF and AES/EBU connectivity. 3. It is emotionally laden, however the attempt to temper that emotion. 4. 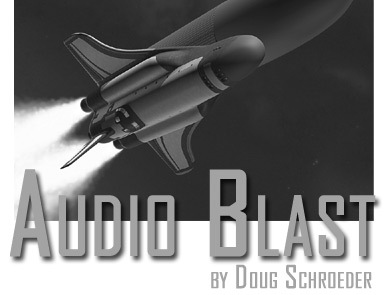 This is a much longer Audio Blast than normal. Therefore, take it, “for what it’s worth”. If you wish to dismiss it entirely, feel free. I would not recommend that. 32. 32 bit. 32 Bit ESS ES9018 Sabre Reference DAC. Remember it well, because it’s what your Redbook and streaming audio soul really wants. It is the future of digital two-channel audio signal treatment, and it’s affordable! Remember when the first Plasma and LCD TVs first burst onto the scene? Remember when color TV was introduced? Oh, you’re not that old – sorry! If you did remember the introduction of color TVs you would remember the feeling of awe at the technological improvement. I’m not going to go so far as to say that the ESS Technology ES9018 Sabre 32 Reference audio DAC chip used in the Eastern Electric Minimax DAC is that radical an improvement, but it’s close in audiophile terms. I work hard not to mindlessly rave about products, but I will holler from the hilltops about new technologies which I feel are beacons of light shining far brighter than the surrounding digital heavens. The EE DAC is a product incorporating the right advancement to positively (I thought I would use a different word than “radically”, as it’s become cliché)alter your digital listening experience. How many times have you heard that? The audio community has been enthusiastic about the Oppo players for good reason – they’re using the ESS 32 bit chip as well. There has been much discussion of the Wyred4Sound DAC-2. Why is that the case? It’s the chip, the technology. Architecture of DAC topology via this chiphas broken through to a new frontier of digital which is in turn leading to a new realm of experience for the audiophile. Just ask people who own these products. The leadership of ESS and the Sabre chip will force competitors to rethink their designs. If they don’t, I believe they will be left far behind this technological advancement. 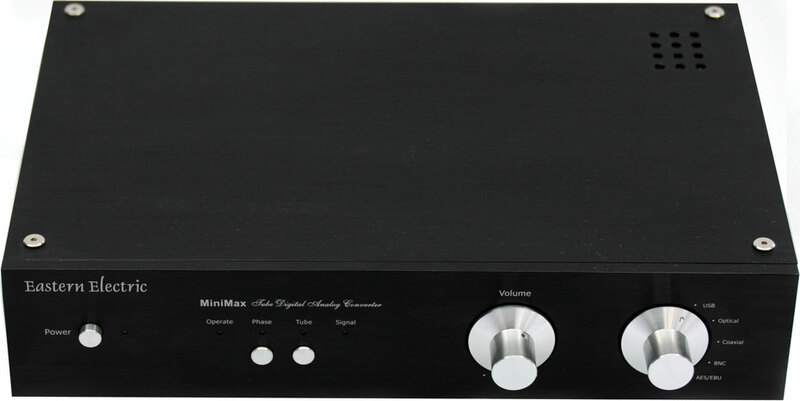 Indeed, according to Morningstar Audio, U.S. importer of Eastern Electric, the Minimax DAC has a, “…Dynamic Range of 129dB, and a staggering Frequency Response from 15Hz-32KHz.” It is not unusual for an upsampling 24 bit/192 KHz player to have a stated dynamic range of 110dB and frequency response of 20 Hz to 20 KHz. In other words, the envelope of potential performance with the Sabre chip is significantly larger. This dawning of the 32 bit chip for DAC conversion in audio devices is so good that I cannot dream of being without it, nor can I see in time any committed designer or audiophile ignoring its impact. When you experience a taste of quality so compelling, you simply don’t want to go back. Going forward, I don’t just want an economical version of the ESS chip, I want the state-of-the-art version! If thisgood of sound can be had from an entry-level DAC, I can’t imagine what the outside limits of design with it will be! With the advent of 32 bit DAC technology, digital sound has become extremely exciting!This is the sector in audio to investigate now. In conversation with Calto Wong of ESS Technology I learned what’s really happening with products like the McIntosh MCD500 which sports the ES9008 Sabre chip at 24 bit/192 KHz, as McIntosh states, in “Stereo Quad Balanced mode.” Or, the upcoming Krell Evolution 555 Blu-ray Player, with its ES9018 Sabre Reference chips, similar to the Minimax DAC. The term “Reference” is applied by ESS to designate their top end chip, followed by Ultra and Premier. What’s going on here? A full scale recalibration of what is considered good digital sound, and it all starts with the ESS chip. There are different levels of quality in the Sabre chip line, and the top is the ES9018 – which actually has eight channels of digital-to-analogue conversion. That is very important, since the hottest new design in building consumer component DACs is what Calto termed the “Quad Differential Mode”. That means using four channels of DAC processing 24 bit/96 KHz for each stereo channel. I believe that in time all leading DAC manufacturers will be doing so. One of the main advantages of using four DACs per channel is a dramatic reduction in noise in the signal. Lower noise means higher, more dramatic sound, and those “blacker backgrounds” we all seek. You can crank on the volume and hear far less noise than with 16 bit or 24 bit processors. Consider what Calto intones, “…When you double the number of DACs you cut the noise in half.” No wonder the Dynamic Noise Reduction (DNR) threshold is at an extreme 135 dB! That means the basis to build really, really, really quiet components. Calto confirmed that the chip does upsample all incoming signals to 32 bit, but the frequency is not fixed. It can vary from 32 KHz, 44.1 KHz, 48 KHz, or 192 KHz. According to him, “…each sample in time will have resolution of a minimum of 32 bit number.” In other words, feed it whatever frequency signal you like, it’ll come out 32 bit. I can hardly overstate the importance of this development. This is a technology which, applied by skilled designers, will decimate current standards of good digital sound, including 24 bit/192 KHz processing. What does it sound like? In comparison to 24 bit/192 kHz DACs I have compared, it is a new world of better clarity, vividness, pathos, drive, bass fullness and transient speed, depth, delicacy, enlarged soundstage, better stereo separation, superior dynamics, superb decay on treble, delineation of low level material, lower noise, etc., etc. It’s as significant as moving from a four-cylinder economical vehicle to a six-cylinder, two-door sports car. I’m not going to say that if such a profound change is not important to you as an audiophile then you’re no audiophile. I’ll simply say it is terribly important to me, because I want as close to the ultimate (read “real”) experience as I can get, not somewhere in the middle. Based on the experience with the Minimax DAC, the goal line for DAC performance has moved far afield; 24 bit DAC chips are now in the middle, the top end is 32 bit. In order to test the consistency of the 32 bit upsampling I tried several tracks fed to the Minimax via 16 bit/44.1 and then 24 bit/192, with the Cambridge Audio Azur 840C connected via digital coaxial cable. The Azur’s digital output can toggle between these two signals on the fly with the remote. There was no discernible a difference in sound between the two modes as they were treated by the Minimax. Similarly, I fed both the standard Redbook signal as well as the upsampled output from the Ayon CD-5 into the Minimax. Again, no discernible difference was heard, even when switching on the fly. It appears there is no significant advantage to sending an upsampled signal to the Minimax; you get the same result either way. This speaks to the consistency of the processing through the Sabre chip. This is great news for people with lower-quality streaming audio. I use a Sonos Digital Music System, which only outputs 16/44.1, but with the Minimax DAC it will have the same sound as if it was a high-end player’s signal being sent to the DAC. The Manual mirrors ESS’s specifications in that all sources are upgraded to a 32 bit and 32 KHz, 44.1 KHz, 48 KHz, or 192 KHz (except USB) sampling rates. In other words, you get the full potential of the highest caliber chip from ESS Technology in a tidy package. It is difficult to exaggerate the importance of this revelation. This fairly makes “Hi Rez” downloads a moot feature. If Hi Rez streams at 24 bits, but one can take plain old streaming audio at 16 bits and get the same result, there’s not much incentive to pursue costly downloads. Alternatively, there’s a lot of incentive to gravitate toward music websites like Rhapsody, or one of my new favorites, Lastfm.com; the final outcome as treated by the Minimax is theoretically better than your typical Hi Rez sound! I say theoretically, as I have not actually compared Hi Rez files to those upgraded by the Minimax. However, there is no mistaking the upgrade to the sound of even a 24 bit signal from a Redbook player.